He's the only man to have started more races before winning the world championship than Jenson Button, but it could have been so different for Nigel Mansell. After learning the ropes at Lotus, Mansell's career came alive when he joined Williams in 1985. A title challenge followed in 1986, where he was cruelly robbed in famous style in Adelaide, while a practice crash at Suzuka a year later cost him another shot at the crown. It would be four years before Mansell was back in a title-challenging car, but during that time he was able to endear himself to the Ferrari-loving tifosi, who idolised 'Il Leone' almost as much as his adoring British fans. Equipped with the dominant FW14B, Mansell was unstoppable in 1992, wrapping the title up by August. It was a record-breaking season, which only Michael Schumacher has surpassed. 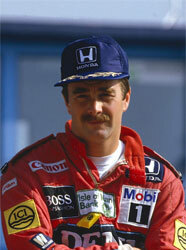 Should Nigel Mansell be higher or lower in F1's greatest drivers?